espite its name, the folks at Import Performance fix more than just imports. From Sprinter vans to heavy duty Chevy pickups, all the way down to the Honda Civic you've been driving since high school, Import Performance can not only fix it, but does so with excellent customer service that keeps Bendites coming back. One of the greatest benefits to taking your vehicle to Import Performance? They offer the use of a loaner car while your car is in the shop — for free! You just pay for the gas upon returning the vehicle. This awesome perk comes in handy when the stars don't align in your schedule, as it rarely does when you need automotive work done. With a 11,000 square foot facility, completed in 2015, Import Performance has been designed to be the most advanced independent auto repair shop in Bend. Gabriel Christian opened the family owned auto repair business in 2002. 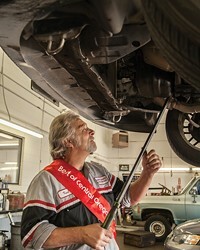 Christian employs skilled technicians who have earned the trust of Bend vehicle owners since opening. Christian himself is A.S.E. Master Certified and graduated at the top of his class from Sequoia Institute, a prominent technical school. "This community is my community," Christian says. "Most Bend folks moved here for similar reasons and we are happy people. I feel fortunate to deal with many great customers, some of them I have been serving for over 15 years!" Needless to say, Import Performance has eclipsed the competition in Bend.